When Christians Get It Wrong, Part 3: Jesus was hard on us ordinary sinners, too! In this chapter, Hamilton is mostly concerned with religious hypocrisy. Christians “get it wrong” when they act in ways that are inconsistent with the faith they profess. Who could disagree? If you read the Gospels carefully, Jesus never got angry with prostitutes, adulterers, or ordinary “sinners.” Nor did his actions turn such people away. In fact, Jesus drew “sinners” to himself by the thousands. He made such people feel at ease. The only people Jesus had words of judgment for in the Gospels were the religious folks. What angered him the most about these people, particularly the religious leaders, was their judgmentalism, their hypocrisy, and their failure to love.Where to begin? First, a quibble about the word “anger.” Is it accurate to say that Jesus got angry with anyone—at least in the sense of losing one’s temper? (How else do we use the word today?) If getting beaten, whipped, spat upon, and nailed to a cross failed to make Jesus angry, why would he get angry with mere Pharisees and other opponents? Yes, I know that Jesus’ overturned the money-changers’ tables in the Temple and drove out the merchants and their livestock. If that’s “anger,” however, it’s a righteous kind of anger of which most of us are incapable. But our Lord is not guilty of the anger he describes in Matthew 5:21-22, which he says is on the same spectrum as murder. His prohibition against it is broad and severe: “everyone who is angry with his brother will be liable to judgment.” We like to qualify our anger: “Yes, I agree with Jesus that most of the time anger is unwarranted, but in this particular case it’s justified. Let me explain why.” Instead, Jesus says, Don’t get angry. Ever! So we can assume that he didn’t, either. More importantly, though—even with a nuanced understanding of the word “anger”—is it fair to say that Jesus “never” got angry with “prostitutes, adulterers, or ordinary ‘sinners,'” that he “drew ‘sinners’ by the thousands” and “made such people feel at ease”? What about Jesus’ fellow Nazarenes, who, far from feeling “at ease,” “took offense at him” (Mark 6:3). In fact, Luke tells us that when the townspeople heard his sermon, “all in the synagogue were filled with wrath. And they rose up and drove him out of the town and brought him to the brow of the hill on which their town was built, so that they could throw him down the cliff” (Luke 4:28-29). Jesus “marveled because of their unbelief” (Mark 6:6) and said, “A prophet is not without honor, except in his hometown and among his relatives and in his own household” (Mark 6:4). Was Jesus not “angry” with these “ordinary ‘sinners'”? Jesus’ own family also failed to feel “at ease” with him. They believed he had literally lost his mind (Mark 3:21). Jesus spoke “words of judgment” against them when he said, “Who are my mother are my brothers?… Here are my mother and my brothers! For whoever does the will of God, he is my brother and sister and mother.” Jesus was implying that his own immediate family were not doing God’s will, whereas the disciples gathered round him, who unlike his family believed in him, were his true family. Jesus spoke words of judgment against the Rich Young Ruler (not one of the “religious folks” to whom Hamilton refers above) in Mark 10:17-31 (and parallels), against several Galilean towns and villages filled with ordinary sinners (Matthew 11:20-24)—indeed, against the entire city of Jerusalem (Matthew 23:37-39; Luke 19:41-44), the vast majority of whose citizens were ordinary sinners. There’s no indication here that he was talking to “religious folks” in this passage, yet who doubts that Jesus did the opposite of making his hearers feel “at ease”? And what about the parables of Jesus, whose judgments were often against both religious leaders and ordinary sinners. Is the man not wearing proper wedding attire in the frightening postscript to the Parable of the Wedding Banquet (see Matthew 22:1-14) only supposed to be a religious leader? What about the five unprepared virgins of Matthew 25:1-13, or the poor servant who buried his talent in Matthew 25:14-30, or—for that matter—any member of the human race identified as “goats” in Matthew 25:31-46. You can probably think of other examples of Jesus getting “angry” or at least making ordinary sinners uncomfortable. These are enough to make my point. While it’s true, as Jesus says, that “the tax collectors and the prostitutes are entering the kingdom of God ahead of” the scribes and Pharisees (Matthew 21:31), that’s only because these ordinary sinners recognized the extent of their sinfulness and need for repentance. As Jesus elsewhere says, “Whoever has been forgiven little loves little” (Luke 7:47). The sinners to whom Hamilton refers knew they had been forgiven much. If Jesus came down hard on religious leaders’ “judgmentalism, hypocrisy, and failure to love,” he did so because these sins, especially, had a way of insulating their practitioners from the gospel. After all, if your prayer begins, “God, I thank thee, that I am not as other men are,” you won’t believe you need a Savior—that you are as other men are—helpless sinners in need of God’s rescue plan through his Son Jesus. This the necessary starting point, the sine qua non, of the gospel. But as I’ve said before, our United Methodist tradition often fails to preach the first half of the gospel; we head straight for grace and forgiveness without first dealing with sin, God’s judgment, wrath, and hell. We tell our fellow sinners, “There, there… It’s not so bad” when, actually, it is that bad. In fact, apart from our faith in Christ and his atoning death on the cross, it’s much, much worse! In the video that accompanies this chapter, Hamilton urges us Christians to be like Jesus. While that would be wonderful, of course, I wonder if it’s pastorally helpful advice. Do any of you have much success “being like Jesus” for any length of time? I don’t. Here’s a better idea: Read Luke 7:36-49. Identify with the “woman of the city, who was a sinner.” She is who we are or ought to be—sinners who have been “forgiven much” and who, therefore, delight in loving and serving Jesus. 1. When Christians Get It Wrong, rev. ed. (Nashville: Abingdon, 2013), 11. 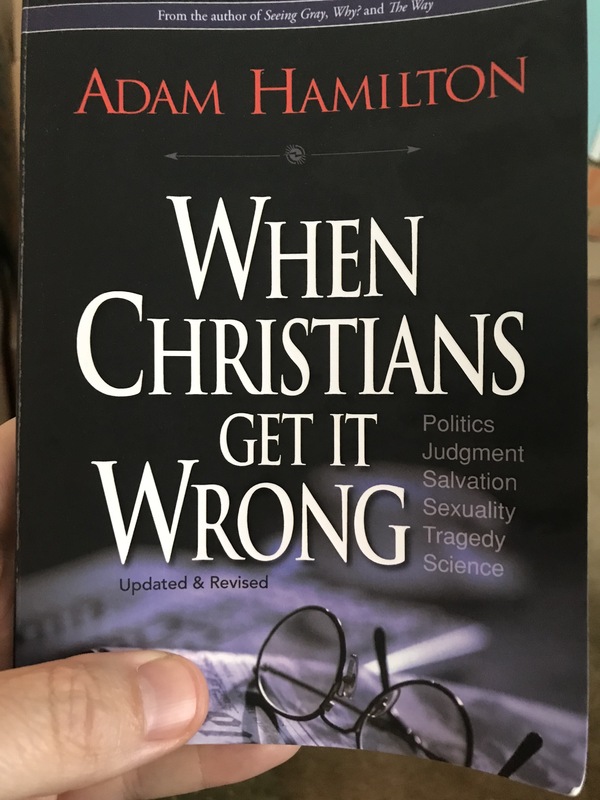 Adam Hamilton’s When Christians Get It Wrong, Part 2: Hypocritical Christians… like me? In C.S. Lewis’s Screwtape Letters, Uncle Screwtape, a demon who is experienced and successful in leading human “patients” to hell, apprentices his nephew Wormwood in the art of temptation. Wormwood’s patient has recently become a Christian. From Screwtape’s perspective, this fact alone does not spell disaster: the patient, he says, may yet become apostate and arrive safely in hell. I have been writing hitherto on the assumption that the people in the next pew afford no rational ground for disappointment. Of course if they do—if the patient knows that the woman with the absurd hat is a fanatical bridge-player or the man with the squeaky boots a miser and an extortioner—then your task is so much the easier. All you then have to do is to keep out of his mind the question ‘If I, being what I am, can consider that I am in some sense a Christian, why should the different vices of those people in the next pew prove that their religion is mere hypocrisy and convention? You may ask whether it is possible to keep such an obvious thought from occurring even to a human mind. It is, Wormwood, it is! Handle him properly and it simply won’t come into his head. He has not been anything like long enough with the Enemy [that is, God] to have any real humility yet. What he says, even on his knees, about his own sinfulness is all parrot talk. At bottom, he still believes he has run up a very favourable credit-balance in the Enemy’s ledger by allowing himself to be converted, and thinks that he is showing great humility and condescension in going to church with those ‘smug’, commonplace neighbours at all. Keep him in that state of mind as long as you can. “You’re right, Rev. Hamilton! I can think of examples. In fact, I saw one living, breathing example of a judgmental, hypocritical, and unloving Christian when I looked in the mirror this morning!” In fact, even as I write these words (if you can’t tell from my tone) I’m feeling morally superior to you. A part of me wants my readers to recognize this superiority, admire my boldness in criticizing a well-respected leader in my denomination, and appreciate my self-awareness, which I hope they’ll mistake for humility. See… I am a mess. I’m a sinner! And I’ve been a professing Christian for thirty-plus years! While I won’t excuse my sinfulness, I will point out that I am exactly the kind of person whom Jesus Christ came into the world to save: “Those who are well have no need of a physician, but those who are sick. I came not to call the righteous, but sinners” (Mark 2:17 ESV). Honestly, is Adam Hamilton’s experience with sin different from mine? Has he already been entirely sanctified (as we Methodists might say)? If not, how do Screwtape’s words not apply to him, to the young woman he quotes above, to John, the young veteran whose conversation inspired this book, or to anyone else? If I, being what I am, can consider that I am in some sense a Christian, why should the different vices of those people in the next pew prove that their religion is mere hypocrisy and convention? See, while I wouldn’t deny for a moment that we Christians “get it wrong,” often, I would add that we Methodists, specifically, get it wrong when our doctrinal emphasis on sanctification causes us to lose sight of our justification. (I’ve said this before.) What I mean is this: We Methodists need to hear again and again that we are, in Luther’s phrase, simul justus et peccator (“both righteous and sinners at the same time”). We never outgrow the good news that we are sinners justified by God’s grace alone! Not an iota of holiness on our part (by which we Methodists often twist to mean “self-improvement”) will play a role in making us more or less acceptable before God. Why? Because we are made holy and perfect before God for one reason alone: Christ has imputed his righteousness to us as a free gift. This truth ought to make our hearts sing! God alone does the justifying simply by declaring the ungodly to be so, for Jesus’ sake. Most everyone is willing to concede that, at least in some fashion. But, of course, then comes the question: what happens next? Must not the justified live properly? Must not justification be safeguarded so it will not be abused? So sanctification enters the picture supposedly to rescue the good ship Salvation from the shipwreck on the rocks of Grace Alone. Sanctification, it seems, is our part of the bargain… The result of this kind of thinking is generally disastrous…… as my own experience bears witness. Don’t misunderstand me: I completely agree that we Christians must repent of hypocrisy and all other sins as we become aware of them. We must pray that the Holy Spirit will give us the power to overcome these sins and expect that he will. The Bible says that our lives must “bear fruit in keeping with repentance” (Luke 3:8), because faith without works is dead (James 2:17). But this fruit, our good works, and the extent to which the Holy Spirit enables us to overcome our sin, play no role in saving us. Good fruit, as Jesus says, is merely evidence of a healthy tree (Matthew 7:17). Only God can make the tree healthy. Once he does, the good fruit will follow. Am I wrong? When we are justified and born again, does God say, “Now let’s wait and see how it goes”? Heaven forbid! Instead, he says, “Today salvation has come to this house” (Luke 19:9). While it’s true that we Methodists believe in the possibility of backsliding, backsliding isn’t the result of any sin other than the abandonment of our trust in Christ. To say the least, God’s mercy toward sinners is a feature of Christianity, not a defect. I’ll deal with the rest of Chapter 1 later. 1.C.S. Lewis, “The Screwtape Letters” in The Complete C.S. Lewis Signature Classics (New York: HarperOne, 2002), 189-90. 2. Adam Hamilton, When Christians Get It Wrong, rev. ed. (Nashville: Abingdon, 2013), 9-10. 3. “The Art of Getting Used to Justification,” mockingbird.com, 29 November 2012. Accessed 15 August 2018. If you’ve been reading my blog for a while, you know that for many years I’ve been an outspoken critic of United Methodist mega-church pastor Adam Hamilton. For example, this post remains the most-read post I’ve written on my blog—by far! Rev. Hamilton himself tweeted that he would respond to this series of posts from last year. I’m still waiting, but he’s a busy pastor, and who am I to him? I wouldn’t respond to me, either. Still, a men’s Bible study group at my church is reading his little book When Christians Get It Wrong. So I thought it would be helpful for me to gather my own thoughts on the book here. You might find it helpful, too. In the book’s introduction he says that this book “was born out of a conversation” with a disillusioned young war veteran named John, recently returned from Afghanistan and Iraq, who talked to Hamilton about the reasons he rejected Christianity. John’s reasons, Hamilton said, correspond to those cited by Kinnaman and Lyon in their book unChristian (which I’ve also read). Hamilton’s book, he said, is written primarily for John and his fellow young adults who are abandoning Christianity in larger numbers than previous generations, for the same reasons cited by Kinnaman and Lyon. When Christians Get It Wrong, therefore, serves an apologetic purpose: to win back these young apostates to the Christian faith. Young people have, he says, been “frustrated and turned off by what they have heard from and experienced with Christians.” So the theme of Hamilton’s book is that what they’ve experienced isn’t real Christianity, or they’ve misunderstood it. Hamilton wants to show them what real Christianity looks like, and his vision, he believes, will be so compelling that they’ll change their minds. A worthy goal, I’m sure. Still, we pastors, especially, should be reluctant to take at face value the reasons an unbeliever gives for moving from faith to skepticism. We are all sinners, after all—and complicated ones at that. At our best, we hardly know ourselves or the reasons for the things we do. Instead, we know our “cover stories.” Too often, we who see through a glass darkly remain oblivious to many of the underlying impulses that give rise to them. Also, Hamilton presumes that John and all these young people are (or were) authentically Christian at some point; that they were genuine believers who have now left the faith. But Hamilton can’t know that. None of us can. We pastors are painfully aware that, despite our best intentions, no catechism or confirmation class, no “walking the aisle” at the end of a sermon, no praying a sinner’s prayer, no baptism, can ensure that a young person who professes Christian faith is born again. Only God knows. I hope and pray that this book will help some young adults find faith once more and become followers of Jesus Christ. It is also my hope that the book might chart a path for Christians in how we can “get it right.” Churches that “get it wrong” may lose an entire generation of young adults, the future of the church. By all means, I’m all for correcting Christians who “get it wrong.” Nevertheless, it’s not our job to make the gospel something other than what it is: “folly to those who are perishing… a stumbling block to Jews and folly to Gentiles” (1 Corinthians 1:18, 23). Did the apostle Paul sometimes “get it wrong”? Since he was “foremost” of sinners (1 Timothy 1:15), he would agree with me that he did. But he didn’t get his gospel wrong (Galatians 1:8), nor the God-breathed words that the Holy Spirit guided Paul to write. Needless to say, if that was true for Paul as he sought to convert the lost people of his day, it will be true for us! Therefore, we shouldn’t be surprised when most “young people”—or anyone else—tell the Church that Christianity is, in so many words, “folly” and a “stumbling block.” What else would we expect them to say? Christendom, that once-powerful cultural force that used to produce nominal Christians but no longer does, is dead. Young people today will less often identify as Christians merely because their parents or grandparents did. Those days are gone, and good riddance! “For the gate is narrow and the way is hard that leads to life, and those who find it are few” (Matthew 7:14). That’s always been true, no matter what popular opinion polls would say. Besides, I know plenty of young people, even today, for whom Christ continues to be “the power of God and the wisdom of God” (1 Corinthians 1:24). How does that still happen, if things are as bad as Hamilton fears? Simple: Ultimately, it’s not up to us to convert people. For as often as Christians “get it wrong,” which is often, the Holy Spirit continues to “get it right,” and to do his good work: “The wind blows where it wishes, and you hear its sound, but you do not know where it comes from or where it goes” (John 3:8). “And I, when I am lifted up from the earth, will draw all people to myself” (John 12:32). “And this is the will of him who sent me, that I should lose nothing of all that he has given me, but raise it up on the last day” (John 6:39). So, as we diagnose problems for which Hamilton’s book purports to be a solution, let’s proceed with caution… The sky may not be falling after all. More soon. 1. Adam Hamilton, When Christians Get It Wrong, rev. ed. (Nashville: Abingdon, 2013), 3. 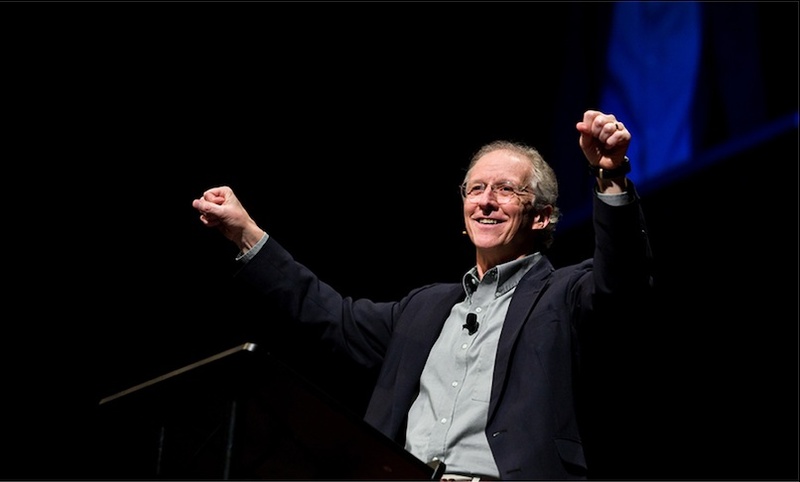 Pastor John Piper understands how high the stakes are. 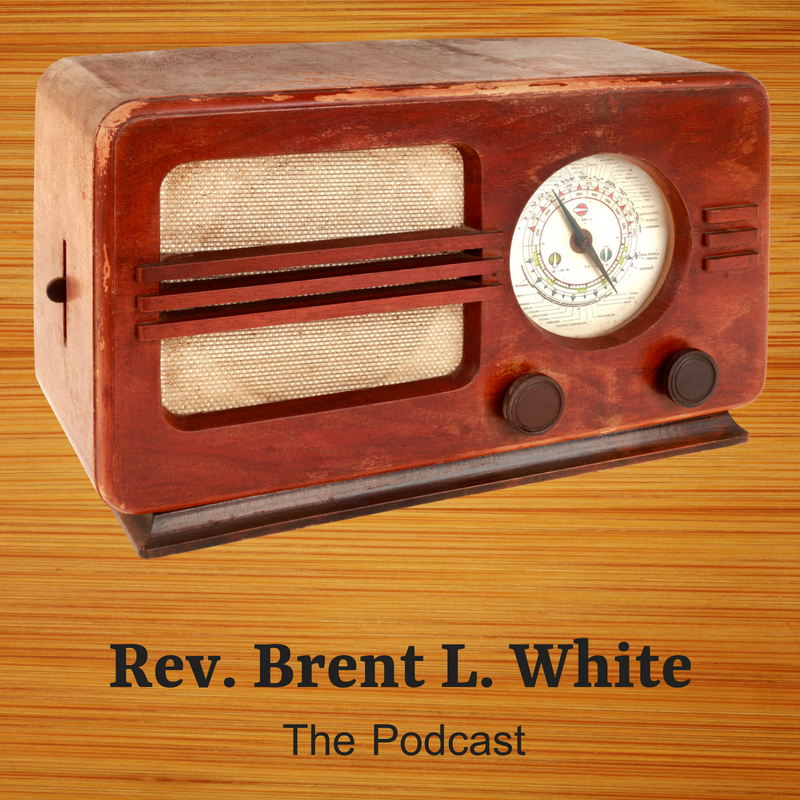 In my previous podcast episode, I talked about the inadequacy of most Christians’ efforts (including my own) to witness. I said that all Christians are ministers who are called to this task, as evidenced by the Great Commission that Christ gave to his Church. Other listeners likely fear that certain techniques for witnessing risk “turning people off” to the gospel. (One point I made in the podcast, however, is that the gospel will turn many people off, no matter how well or poorly we present it.) Other listeners disagree with any self-conscious technique or effort to evangelize. They believe that we should follow the prompting of the Spirit and let opportunities for witnessing flow organically. Any ulterior motive to share the gospel with someone, rather than enjoy a relationship on its own terms, spoils the effort. While I would argue against these objections, that’s not my point today… My point is, even if you disagree with something I said in my podcast, I hope we can agree on this: We live in a world in which the vast majority of people (judging only by objective demographic surveys) need Jesus and the gift of eternal life that’s available through him. Moreover, we have a deadly Enemy, Satan and his demonic forces, working to thwart even our most well-intentioned efforts to convince people of the truth of the gospel. We are at war, as Paul says in Ephesians 6, the stakes of which are higher than any merely human war. So I’ll grant that, for any number of reasons, you may feel unqualified to witness. Fine… Given that nothing less than heaven or hell hangs in the balance, however, let’s figure out what you can do to reach lost people with the gospel: First, if you’re a parent, consider the lives of your children your most important mission field and respond accordingly: You are constantly “witnessing” to them, whether you know it or not. They are learning from you every moment about who Jesus is and how important he is to you. Your example will have a far greater influence on how they’ll spend eternity than anything they learn at church. You have an awesome responsibility! Don’t take it lightly. Pray for the Holy Spirit to empower your church to be bold and successful in evangelism—not just “sheep-stealing,” which is what counts as evangelism in most churches. On that note, stop worrying about “growing the church” and worry instead about making disciples. Invite unbelieving or lightly committed Christian friends, neighbors, and co-workers to church. Support and encourage your church in its evangelism efforts. Give more money and volunteer more time for the cause of Christ in your church and world. Live in such a way that people outside the faith notice that you treasure your relationship with Christ above all earthly treasures. Pray for revival in your church. Pray for an outpouring of the Holy Spirit. Pray especially for your pastor or pastors as they seek to be faithful to their call! The phrase is helpful… It tells me that there is a war going on in the world between Christ and Satan, truth and falsehood, belief and unbelief. It tells me that there are weapons to be funded and used, but that these weapons are not swords or guns or bombs but the Gospel and prayer and self-sacrificing love (2 Corinthians 10:3-5). And it tells me that the stakes of this conflict are higher than any war in history; they are eternal and infinite: heaven or hell, eternal joy or eternal torment (Matthew 25:46). I need to hear this message again and again, because I drift into a peacetime mind-set as certainly as rain falls down and flames go up. I am wired by nature to love the same toys that the world loves. I start to fit in. I start to love what others love. I start to call the earth “home.” Before you know it, I am calling luxuries “needs” and using my money just the way unbelievers do. I begin to forget the war. I don’t think much about people perishing. Missions and unreached peoples drop out of my mind. I stop dreaming about the triumphs of grace. I sink into a secular mindset that looks first to what man can do, not what God can do. It is a terrible sickness. And I thank God for those who have forced me again and again toward a wartime mind-set. That second paragraph, especially, convicts me. “I drift into a peacetime mind-set… I begin to forget the war. I don’t think much about people perishing.” Instead, I worry about worship attendance; I fret over the already-saved leaving for another church (and taking their tithe with them); I’m too easily satisfied with “church growth,” which relates to marketing and sales, rather than making disciples. But no longer… Lord, help me live with a wartime mindset. Place people in my lives who will hold me accountable to live this way. Amen. 1. John Piper, Don’t Waste Your Life (Wheaton, IL: Crossway, 2009),111-2. 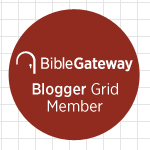 What was the Old Testament sacrificial system for? I’ve told friends and acquaintances that if I had to do seminary over again, I would have asked many more questions. For instance, one question, which embarrasses me to write “out loud” because the answer seems obvious to me now, is this: If God gave Israel the sacrificial system of the tabernacle/temple as a means of forgiving sins, why did Jesus need to offer himself as a sacrifice for sins? What did Christ’s once-for-all sacrifice accomplish that ancient Israel’s sacrifices couldn’t—even assuming that Israelites carried them out perfectly? Here’s one wrong answer we can rule out immediately: that Israel “tried” temple sacrifices, they didn’t “work,” therefore God sent his Son Jesus. This makes no sense of a God who transcends time and has foreknowledge, much less of the “Lamb slain from the foundation of the world” (Revelation 13:8 KJV). No: before God created a people, Israel, he intended to save them through a descendant of Abraham (Genesis 3:15; 12:1-3), not through temple sacrifices. But the person who does anything with a high hand, whether he is native or a sojourner, reviles the Lord, and that person shall be cut off from among his people. Because he has despised the word of the Lord and has broken his commandment, that person shall be utterly cut off; his iniquity shall be on him (Numbers 15:30-31). Whatever these “high-handed” sins are, they are in contrast to “unintentional” sins only (Numbers 15:22-29), for which temple sacrifices could atone. I sometimes sin “intentionally” and “deliberately.” Don’t you? This fact alone ought to give us pause. Sin is deadly serious, and we are in trouble apart from God’s grace. Shall I give…? The values of the sacrifices escalate in an attempt to discern the price for entering God’s presence. The way in which the proposals increase in absurdity, ending with an outrage (ten thousands of rivers of oil… my firstborn), shows that Micah is exposing an attitude that wrongly sees sacrifice as an entry fee, rather than as an avenue for God to administer grace and forgiveness to the penitent (who will express thanks as v. 8 describes). This is insightful: Temple sacrifices were not an “entry free”; they did not pay a debt that God’s people owed for their sin. They were an avenue of God’s grace, not the foundation of that grace. If God’s people were counting on sacrifices themselves to save them, rather than God’s grace, as Micah implies here, their guilt remained. Yet it is difficult to see why people then or now seem to breathe easier when the prophetic conception of true sacrifice is announced: To do justly, and to love mercy, and to walk humbly with thy God. Or as Moffatt has translated it, “To be just and kind and live in quiet fellowship with your God.” This may sound comforting and comfortable to the man who has never tried it, but the unanimous verdict of prophetic spirits through the ages underscores its costliness. Every student of law knows how necessary yet how difficult the quest for justice has been and continues to be. Mercy and humility are surely two of the highest and holiest of virtues—and no others are more difficult of the kind of achievement God requires, i.e., incarnation. Yet Micah joins the prophetic succession of Amos, Hosea, and Isaiah in demanding just this. Interpreters often speak as if Micah is pitting a religion of ritual against a religion of the heart—and of course God desires a religion of the heart. I’m sure that’s true. But as Bosley implies, the heart of humanity’s problem is the heart! Why should that make us “breathe easier”? It should instead bring us to our knees—not to mention the foot of the cross, where Jesus, Israel’s (and humanity’s) representative, lived the life of perfect justice, kindness, and humility that we were unable to live and suffered the punishment we deserved to suffer. Nothing less than the blood of Jesus, therefore, is the price for entering God’s presence. And through Jesus we have new birth through the Spirit—by whom our heart is transformed. Ultimately, the Old Testament sacrificial system, then, is intended to point us to Christ’s sacrifice for our sin, the costliest sacrifice imaginable—because his life is of infinite worth. 1. W. Brian Aucker and Dennis Magary, “Micah” in The ESV Study Bible, ESV (Wheaton, IL: Crossway, 2008), 1705. 2. Harold Bosley, “The Book of Micah,” in The Interpreter’s Bible, vol. VI (Nashville: Abingdon, 1956), 940-1.